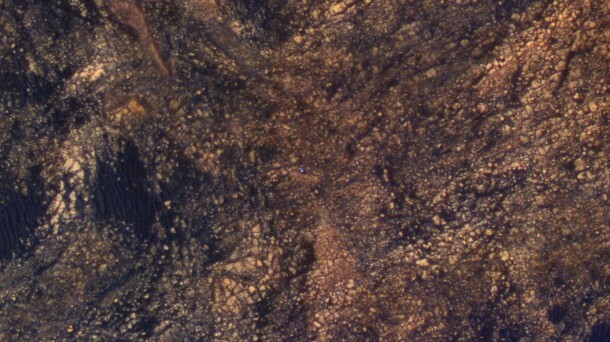 Using the most powerful telescope ever sent to Mars, NASA’s Mars Reconnaissance Orbiter caught a view of the Curiosity rover this month amid rocky mountainside terrain. The image was taken on June 5, 2017, two months before the fifth anniversary of Curiosity’s landing near Mount Sharp on Aug. 5 PDT (Aug. 6, 2017, EDT and Universal Time). When the image was taken, Curiosity was partway between its investigation of active sand dunes lower on Mount Sharp, and “Vera Rubin Ridge,” a destination uphill where the rover team intends to examine outcrops where hematite has been identified from Mars orbit. HiRISE obtains images of Curiosity a few times each year. The University of Arizona, Tucson, operates HiRISE, which was built by Ball Aerospace & Technologies Corp., Boulder, Colorado. NASA’s Jet Propulsion Laboratory, a division of Caltech in Pasadena, California, manages the Mars Reconnaissance Orbiter Project and Mars Science Laboratory Project for NASA’s Science Mission Directorate, Washington.